Dare2tri was founded in 2011 to provide the opportunity for those with physical disabilities and visual impairments to be engaged in inclusive community recreation. What began with 8 participants has now grow to serve more than 350 each year and includes a wide range of programs, over 30 partnerships, and a community with thousands of lives impacted. MANY PEOPLE WITH PHYSICAL DISABILITIES AND VISUAL IMPAIRMENTS FACE SIGNIFICANT BARRIERS TO BEING PHYSICALLY ACTIVE. No access to adaptive equipment, transportation, or accessible facilities. Limited opportunities to be physically active or receive adequate coaching. Costs associated with being physically active can be a barrier to participation. 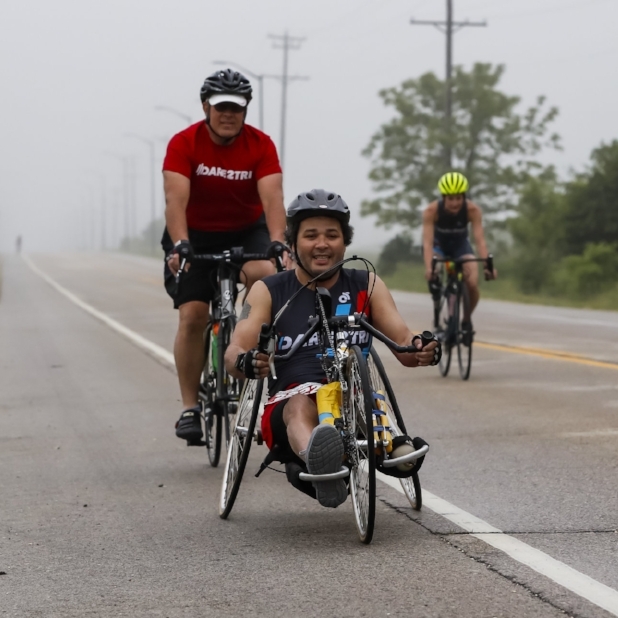 Dare2tri provides adaptive equipment, transportation in our ADA bus, and access to accessible facilities through partnerships with organizations like Chicago Park District. Dare2tri offers year-round programs and practices that give athletes the chance to learn and exercise alongside peers. Dare2tri provides scholarships and a fund—the Ability Fund—to cover expenses related to participation. Chele has been part of the Dare2tri community for 3 years. This year our community witnessed the sounds and tears of joy as Chele took her first strides on a running blade. Jeremy had never been to a Dare2tri event before, his disability had kept him inactive for years. On the last day of camp our volunteers, coaches, and fellow athletes cheered as Jeremy crossed the finish line for the first time in our “Tri it” Triathlon.